Cats, bantams and chickens can coexist peacefully and be trained to live together in the same space. It will be easier if you get the chickens before the cats and if they grow up with chickens then the cats will be used to having them around. 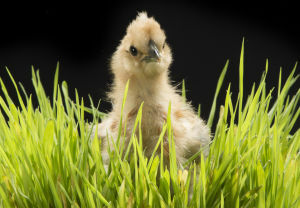 Cats must be kept away from chicks and growers up to around 10 to 12 weeks of age, they can easily kill chickens of this size. Below: The chickens stealing the cats food, you may have the opposite of the peoblem you think you will. The cat might be the bullied one. You are less likely to have problems if you have a bigger flock. A cat might approach a trio of bantam hens for example but will shy away from a cockerel with 8 hens. 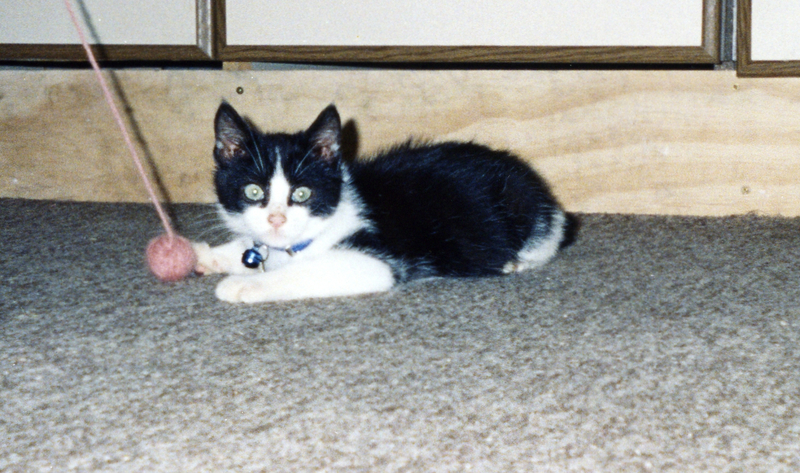 Kittens being playful and testing their strength are likely to be the biggest problem. With careful training, patience and care both animals can live together. 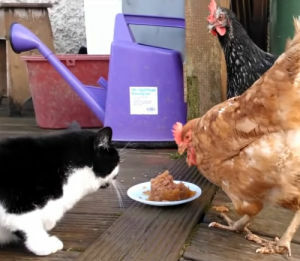 Most of the time when people see photos and videos of a cat and chicken playing together, they are awe stuck and think it’s quite rare for a sight. But to all those who domesticate animals, they know that it’s pure precision in training them to live together without hurting each other. Those who like to keep pets or those who domesticate animals and wish to keep pets do a lot of research on this matter. As a result, you will see a lot of Google searches and Quora and related search material over the internet. It seems to be a good practice to research and know well before you decide to keep more than one type of pet at home. Can you have chickens with cats? Well, this is the obvious question that pops in almost every ones head and probably its right to ask that. Yes, chicks and smaller chickens can be a prey item for a cat. If you have a particularly accomplished hunter you may want to keep it away from polish hens or Serama bantams for example. 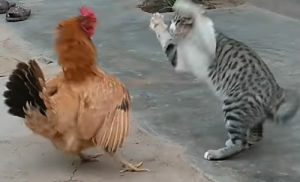 Below: In a struggle, cats and chickens are probably quite well matched. That too doesn’t mean they will always fight or can’t live in peace. In my experience cats and chickens choose to just ignore one another. 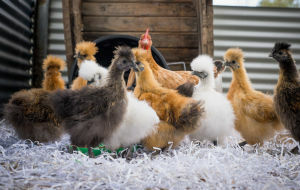 Given these, often people search on a various platform over the internet on how to put their chickens and cats together, or how can they train these two animals to come together. How to train your cat and chicken to live together? 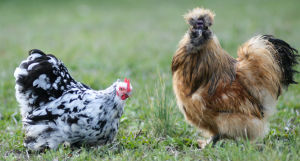 As explained by animal experts, cats should be introduced to the chicken when the chickens are in an enclosed run and the same applies to bantams. If it is going to be a problem a Cat’s instinct will kick in the moment it sees a loose chicken around. So for the safety of the chicken, it’s better to keep it safe and allow the cat to adjust to it being there. keeping them separate will also allow you to see how they behave toward each other. Hens and especially roosters may attack the cat and you may have a completely different problem from the one you thought you were going to have. One thing that you must keep in mind before you begin the training is the nature of both the animals.Both cats and chickens are curious beings. If you have both the animals at home, you cannot keep the cat away always, it will try to figure out, and if it does so, it may trigger its predatory instincts. You may be able to train a cat with food and association, keep the treats that your cat likes as a reward to make it behave nicely and calm around the chickens. Continue this training procedure unless the cat is calm and composed on its own. Ones you are sure that your cat is ready to accept the presence of the chickens, now gradually introduce the chicken and the cat in the open, face to face. But still, do not forget to supervise the animals. Initially, start the intro with little time and gradually keep increasing the time, as the animal’s progress in their compatibility with each other. After this phase is over and both the bantams and cats seem calm and gel together well, you can now allow them to some open time in the backyard, but do not forget to supervise initial outdoor time. Remember they are animals and processes their natural instincts. 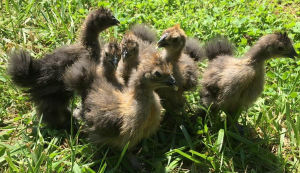 Gradually, they will learn to stay together with least supervision, or even can become good friends but most likely will just tolerate or ignore each other. Can you keep cats out of the chicken pens? Only if you keep the hens in and enclosed run and do not let them free range. Cats can climb and get into some quite small spots so if you are worried, best keep them apart. People from all sorts of places are asking similar questions, like if a cat can attack and kill a chicken or is it safe to keep both as a pet around the backyard? Well, yes there is a high probability that an untrained cat might have a go or attack a chicken or bantam given its natural predatory instinct. It is also likely the chicken will defend itself and the cat will not try more than once. Supervision is required initially, and gradually it can be reduced. Is it common to keep both bantams and cats as a pets? Although it wasn’t a common practice in the past, these days people have started to keep all their pets together. Most of the time there are cats and dogs, or cats and parrots as pets, but now you can find cats and chickens too as pets. Cats are found on a great many farms for their ability to keep rodents away, most poultry farms and owners have started keeping cats as a pet. If you are looking to get a new pet along with having another one, then you can do so without hesitation. But you must know that things won’t happen on their own. You have to work as hard as these animals to make them live together without one hurting the other. Do not forget to show care and compassion to either class of animals. Give them treats and things they like to encourage them. Be playful and enjoy their company. Appreciate their likes and dislikes. All this will help in greater bonding and better understanding. And ones the cats and chicken are all good, you will see a lot of happy moment around in your backyard and want to post videos and photo of your pets playing together.